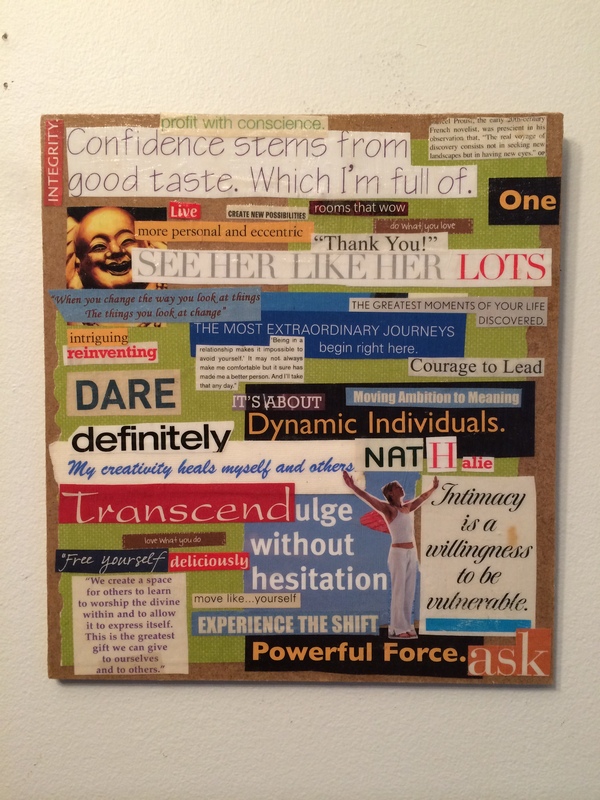 WORD COLLAGES like this one were one of the first tools I used to get unstuck and put myself back together after a major life setback. Colouring outside the lines came much later. Although I really understand the necessity of learning important skills, so many times we are simply told what to do… and some of us really listen…out of fear. (Why do I feel stuck? What if I say the wrong thing, do the wrong thing, and go the wrong way?) Some of us couldn’t care less. (You know who you are. Whoohooo! This is MY life and I am going to live it!) As you can see, everything in the collage above is very straight and almost calculated. I was still very much in fear when I did this but the words were encouraging and eventually became great tools for meditation, intentions and mantras. It’s only much later that I really recognized the woman ‘almost’ taking flight and the face of the smiling Buddha as signs of the freedom I was longing for. That’s where I really started to ‘colour outside the lines’ and my universe started expanding again. That’s where the magic of transformation really happens. If you end up stuck, you unstuck yourself. If you say the wrong thing, it may be the best thing you ever said. If you go the wrong way, you either discover something you love or you go back a few steps knowing the boundaries you set up for yourself and you ask for directions. It’s all in the imperfections my friend; between the lines, outside the lines and zigzagging your way through life YOUR way. The most fun happens when you give yourself permission to wander out, to spread your wings, and to find out what you are really made of. Yes, the lines keep you safe, or at the very least give you the nods of approval you thought you needed to feel competent, worthy and loved. (Look at how great I am at staying inside those lines! What control!) Sometimes, those same senseless lines keep you so straight you forget how to dance, how to stretch and how to think for yourself. Love it. Hate it. Embrace it. You can dance because now you know better. You can stretch because, oh yes, you are stretchable! You know that those lines have nothing to do with WHO you are. They are someone’s ideas imposed on you. Limits, borders, and rules that are there to keep you safe, and sometimes TOO safe. There is a point where limits and limitations become FEAR. The lines keep us in check and we are are afraid to fail, to have fun, to live. Pick up those pencils, that paint, AND that personality and draw yourself right back into your life. Add your intuition to the mix and KAPPOW! You’re standing there naked with the REAL you staring right back in the mirror. Go ahead and colour outside the lines! Get messy. Who’s watching anyway!? In my case, my daughters. My job is to let them know that their entire lives, they will be told to ‘stay inside the lines’ and to cheer them on, dancing right outside the lines along with them any chance we get. Liberating no? What keeps you in check and how do you creatively break free? Share your comments! 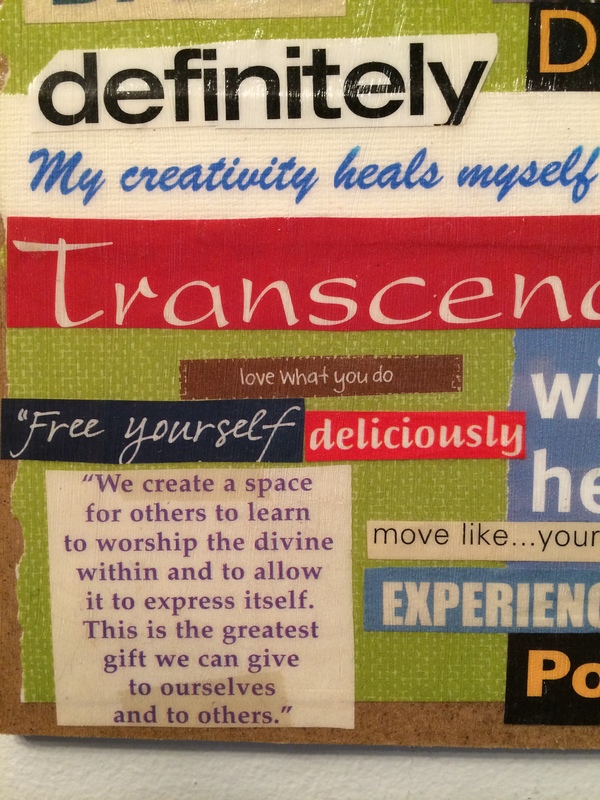 This entry was posted in Creative Life, Self Love, Transformation, Wisdom and tagged Art Therapy, collages, Creative Journey, creative process, dignard, Healing, healing art, Inspirational, letting go, Life's Journey, love of self, nathalie, Nathalie Dignard, nathaliedignard, Transformation, Transformative Art. Bookmark the permalink. Thank you, creative expression is so important! Loved discovering your blog too. An explosion of colors that made me very hungry.